Low qualifications, disengagement from education and training and long-term unemployment are interconnected phenomena and tend to build up throughout a person’s life. 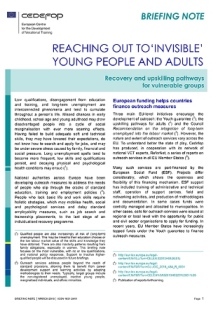 To prevent and combat the marginalisation of youth and adults, national authorities across Europe have been developing measures to address the needs of people who slip through the cracks of standard education, training and employment policies. People who lack basic life and work skills require holistic strategies which may mobilise health, social and psychological services and delay standard employability measures, such as job search and traineeship placements, to the last stage of an individualised recovery programme. A wide range of outreach services has been developed across the EU; however, their nature and extent vary considerably from one country to another. To better understand the state of play, Cedefop has produced, in cooperation with its network of national VET experts, ReferNet, a series of reports on outreach services in EU Member States. Cedefop’s latest briefing note gives an overview of the situation.